Kershaw’s Scallion is a compact knife at the perfect size for everyday carry. A smaller blade allows for easier transport, is less intimidating, and weighing in at only 2.5-ounces, is barely noticeable in pockets. Apart from its color, the navy blue Scallion shares all the same features as the rest of the Scallion family. The 2.4-inch 420HC high-carbon stainless steel blade offers good edge retention and corrosion resistance, a bead-blasted finish gives the blade a non-reflective appearance. The navy blue Scallion is easy to open with one-hand thanks to the SpeedSafe assisted opening mechanism. The Scallion’s handle features strong anodized aluminum scales over steel liners that are resistant to fading and scratching. For safety, a frame lock securely positions the blade open during use and a sliding Tip-lock prevents the blade from opening in transit, while a single-position pocketclip and pre-drilled lanyard hole provide convenient carry options. 2.4" high-carbon 420HC stainless steel blade offers good edge retention and a bead-blasted finish for a smooth, matte appearance. 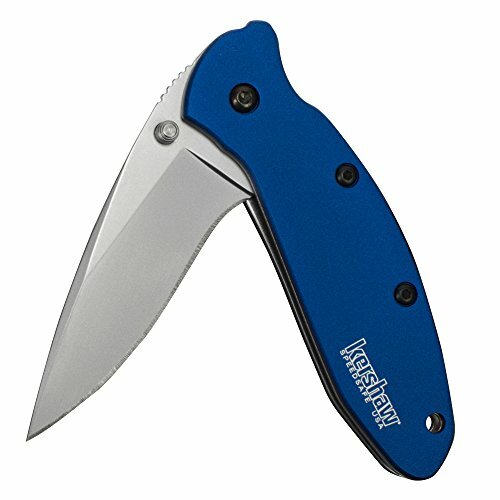 If you have any questions about this product by Kershaw, contact us by completing and submitting the form below. If you are looking for a specif part number, please include it with your message.